Kerala is a land of promises, promise of breath taking natural beauty and amazing new experiences. 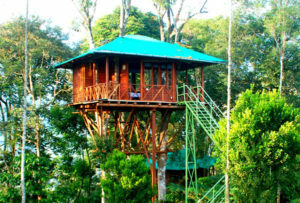 Kerala offers a number of accommodation options one such unique option is the tree house. Known as “Erumadam” in the local dialect, tree house facilities are offered in different parts of Kerala. If you are a nature lover and wish to spend your holiday savoring nature at its best, then ditch the concrete rooms and opt for nature friendly tree houses, and get a taste of adventure and earthy charm of everybody’s childhood dream. Tree houses form the perfect option for those who are looking for some seclusion, away from the overcrowded cities. 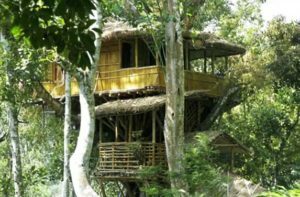 Kerala offers tree houses ranging from rustic to luxurious in different budgets matching requirements of different types of travelers. 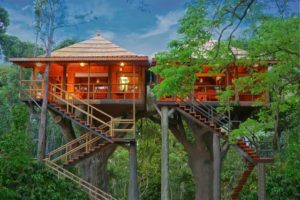 Here is a list of the top 20 tree houses in Kerala. Situated in Thekkady, Idukki District of Kerala Ranger Wood Nature Castle is located very close to the Periyar Wildlife Park. It is safely separated from the Periyar tiger reserve by a very tall and strong net fencing allowing guests not only to enjoy the rich flora and fauna surrounding the tree house compound but do so unhindered by any safety concerns. The twin jungle tree houses resonates luxury & comfort, equipped with all kinds of modern amenities like Led TV, AC, Mini fridge, Coffee/tea maker, luxury mattresses, Wi-Fi & luxury toilets. They are built adjacent to each other but with separate entrances to ensure optimum privacy on two trees 30 feet high from the ground. Room windows of this jungle tree house offer picturesque, panoramic view of the forest and guests can sight many wild animals and rare species of birds. The resort offers activities such as boating, ayurvedic massages, bamboo rafting, hiking, spice tour, elephant ride, jeep safari etc. 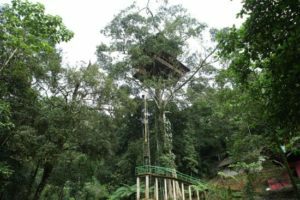 Tree Houses set at an altitude up to 20 to 60 ft from the ground, Tree houses at dream catcher resort are an experience in themselves. Built over 20 acres of plantation in the Bison Valley road near Munnar, tea, cardamom and orange are grown here within the resort premises. Set at a distance of 22kms from Munnar Dream catcher Plantation resort has 4 unique tree houses each with, modern attached bathrooms with 24 hrs h/c water, 100% power back up, writing table & chair, Intercom, TV, Guest Supplies and balconies. The guests can also find some relaxing time indulging in an Ayurvedic spa treatment by expert therapists at the resort. When you stay at the tree house you can also enjoy the activities in the resort including nature tour, spice plantation visits, bird watching, adventure and sightseeing tours, campfire, barbecue, etc. Tucked away in the middle of a magnificent 400 hectares of plantation at the Kuppamudi Estate, Wayanad District about 12kms from Wayanad town, the tree house is a part of a plantation bungalow which has extensive verandas with eye-catching furniture and plants, and the two tree houses are arguably the best in the state. The Serenetree Tree Villa can easily accommodate a family of four with a queen size bed and two day beds. The villa gives its guests beautiful views of the coffee plantation from its large verandah. Perched upon a large Gulmohar tree at a height of 45 feet from ground level the Tranquiltree treehouse comes with a rustic but luxurious décor. The amenities include a mini-fridge, hot water, LCD TV, tea & coffee maker, wardrobe, bathrobe & bath slippers, laundry service, and an in-room safe. The guests can indulge in bird watching, tranquil walks, relaxing ayurvedic massages and a calming dip in the pool. Set in the midst of 15 acre plantation of tea, coffee, pepper and cardamom, Jungle Jive Treehouse is at a distance of 17 kms from Munnar town. This, family run cottage at Devagiri is homely and comfortable. Jungle Jive is an eco-friendly establishment which suits adventure loving families, romance seeking couples or groups in search of some fun. The treehouse rooms are neatly organized in two stories to provide a comfort stay for the weary traveler. All rooms have a balcony with seating area where one can relax breathing in fresh air and admiring the beauty of the jungle. Hiliya Resort is situated at Kenichira in Wayanad districtof Kerala, just 15 kms from Sultan Bathery on NH 212, Calicut-Bangalore National Highway. The resort in located in the midst of an organic farm with spices, herbs, fruits, vegetables and other fauna. 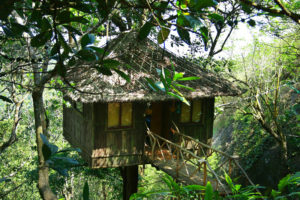 Hiliya Tree house is built on a mango tree about 40 feet above ground level made of wood and bamboo with attached bath. Guests can enjoy a morning walk in the farm; can participate in farming activities such as rubber tapping, coffee plucking, pruning, manuring, weed clearing etc. giving them a taste of rural life. In the evenings guests can spend time by playing badminton in the courtyard or other indoor games or watching TV. The resort management also welcomes guests to participate in cooking and enjoy the pleasure of sharing authentic flavors and traditions of Kerala. Situated around 8 kilometers from Munnar town, Nature Zone Resort is the perfect blend of comfort and tree- house experience. 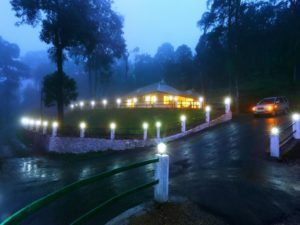 Located at a height of 6000m above sea level, the resort is at Pallivasal, on a scenic hillside plantation. The tree houses are spacious and have a rustic charm to it. They have a balcony that offers some magnificent views of the jungle and the valley. The resort is designed in an eco-friendly way without posing any harm to nature. The sheer joy of waking up to the chirping of birds and sipping hot coffee and enjoying authentic Kerala food is an experience to savor. Guests are allowed to roam around the plantations and are also invited to a campfire organized here every evening. Marmalade Springs is a boutique resort situated near the 2nd highest peak of Wayanad – Chembara Peak. 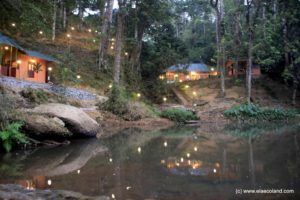 Sprawled within 30 acres of coffee plantation, the resort with cottages built fully in natural timber blending perfectly with nature, has its own cave called the Dorai Cave, natural ponds and a stream flowing between the cottages. One of the oldest tribal colonies is located right next to Marmalade Springs, this enables the guest to experience their customs firsthand and enjoy a night of tribal dance and food. Apart from this, activities like Hiking, Biking, Safari, Bamboo rafting Tribal dance, ATV drive, Barbeque night, and various rope activities are also arranged for the guests. Ideal for the true nature lover Ela Ecoland is a nature resort that offers boutique treehouse facilities. Set at a distance of around 16kms from Munnar town, the resort is tucked amidst deep woods with a river (Kallar) flowing along the premises. 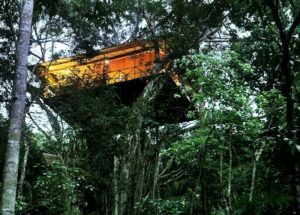 The treehouses are set about 30 feet above the ground level and are built of bamboo with wooden flooring. There is a large balcony with the view of the waterfalls and the flowing river. Only two guests are allowed to stay in the treehouse and children below the age of 5 are not allowed. The resort also offers a variety of activities for the guests such as local treks, off-road jeep safari, tea factory visit, jeep trek to Virippara waterfalls (located near the property), tribal village visits, etc. 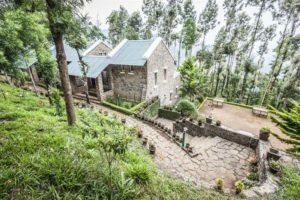 Situated at a distance of around 14kms from Munnar town at Mankulam Road, Letchmi Estate Seven springs plantation resort is a luxurious stay. The tree house not only resonate luxury & comfort, but also rustic charm. Equipped with all kinds of modern amenities like Led TV, Mini fridge, Coffee/tea maker, luxury mattresses, Inter com & luxury toilets, the management has made sure they deliver on their promise of luxury. This constructed on a tree at 30 foot height from the ground the balconies provide a breath taking view of the surroundings. Vythiri Resort is an exquisite jungle getaway located in Wayanad, at a distance of 5 kilometers from Lakkidi which holds the record for the 2nd highest rainfall in World after Cherrapunji. Set along the slope of a forest clad hill this 150 acre property is grazed by a mountain stream forked into 3 within its compounds. Wrapped in the tropical rain forests of Wayanad, this place is destination in itself and is one of the best tree house resorts in the state. A rope bridge across one branch of the stream leads to the coffee shop and restaurant. 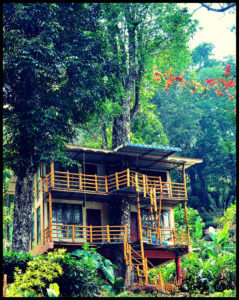 The resort comprises of five tree houses each of which are built at varying heights from 80-35 feet above the ground. Set high above the lush canopy of the rainforest, the quaint thatch roofs and bamboo walls are built by members of the ingenious tribe. Ideal for couples and for small families, children below the age of 12 are allowed only in the family tree house. Situated at Athirappally, Rainforest resort is at walk able distance from the Athirappally waterfalls. Known as the “Niagra of India”, these are one of the most visited falls in the state at a height of 82 feet. 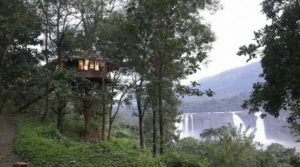 Rainforest resort tree house faces the waterfalls where its guests can wake up to the gurgling of these majestic falls. The majestic Sholayar forest reserves practically cradle this boutique resort. The Rainforest resort is accessible only by a road that winds through the hills and trees of the ravishing rainforest. The tree house is an exceptional example of the fusion of nature with modern architecture. This design marvel, created by a Swiss architect, has been engineered to allow for the needs of the growing tree while allowing a 360 degree view of the surrounding forests and the breath taking waterfalls. 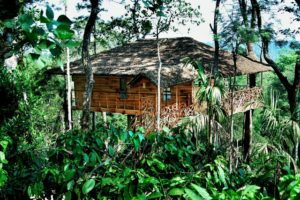 Situated at Kumily, Thekkady, Vanya Tree House is a single house that is located on a hill, built upon a single tree. This simple tree house has become a 4-star accommodation, offering guests a chance to experience the life in a jungle up-close and personal. Every aspect of the Vanya experience is designed to develop a deeper appreciation and respect for the earth and its environment. The activites arranged here include Forest Edge walking to the View Point. Meditation, Bird watching, Campfire, Ranthal light dinner etc. There is no sight of any human habitation for miles around and hence it is idyllic for romantic travelers, adventure seekers and anyone looking to spend some time away from the concrete jungles of the cities. 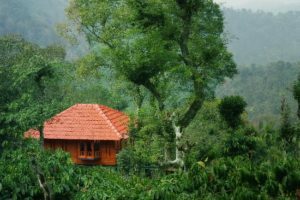 Situated 12kms from Munnar town, Kaivalyam Retreat Treehouse is a unique resort known for its customer friendliness, quality organic food and additional recreational services. The retreat not only offers yoga classes but also encourage its users to believe and practice holistic living. Here the guests are treated with the age old saying of Athithi Devo Bhava(Guests are equal to god) in mind. The rooms are equipped with comfortable bedding, modern showers with hot water, LED TV, telephones, tea kettle, etc. The balcony of the rooms offers picturesque views of the adjacent mountains, valleys and tea plantations. The food served is vegetarian and the dining space is informal encouraging guests to interact with each other. 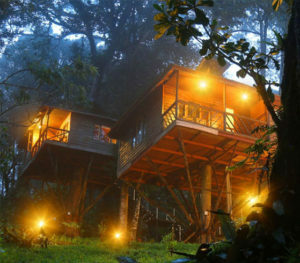 Set on a 1000 year old Banyan tree, Shola Periyar Tree house is located in the midst of rainforests of Kumily, Thekkady. Surrounded by plantations of tea, coffee, cardamom and pepper, the tree houses are built using of indigenous techniques, skills and expertise of local tribal craftsmen. At a height of 80 feet, the tree houses are little slices of heaven laden with all comforts including: beds, bathrooms with flush-able toilets, washbasins with running water, shower with access to fresh natural air and water. Activities such as Nature Walk, bamboo rafting, border hiking, jungle trail, jungle camping etc are arranged for guests here. One of the tallest tree houses in entire Wayanad at a height of 86 feet, Green Magic resort tree house is a an experience of a life time. Situated at Vythiri ,Wayanad, this eco resort has many best kept secrets to rejuvenate your soul and spirit in every way possible. Tree houses nestled in the midst of pepper and cardamom surrounded by exquisite greenery and rich bio-diversity of flora and fauna make your hideaway so special place for relaxation and natural living. The tree houses are incredibly constructed to make guests feel at one with the nature. An elevator to tree house, operated by a man helps guest to get into the tree house. 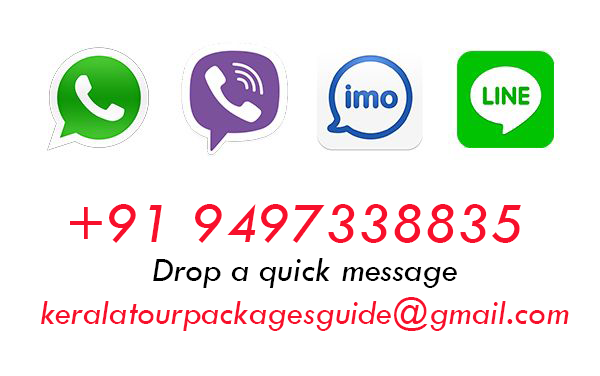 Trekking, rope climbing, night safari etc are arranged for the guests here.